They are unique and simple. I have been making these hearts for over 10 years now. Maybe even more like 12 or 13 years. Each one is different and beautiful. Each one is hand formed with love. I try to perfect each heart. They are made in sterling silver in round and square wires. Some I make with a jump ring and others (as shown here) without. I also make bracelets and necklaces with the hearts all connected together. 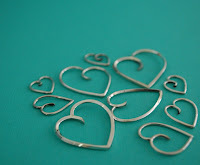 The hearts without a jump ring can hang on a chain or be put in your pocket to remind you of the one you love. The ones shown here I made to show a boutique (Dody's) at Pass-a-Grille beach. She bought all the smaller ones, but I still a few of the larger ones. PS...Free Worldwide Shipping in my Etsy shop this weekend. The heart is a favorite shape of mine. These are adorable!